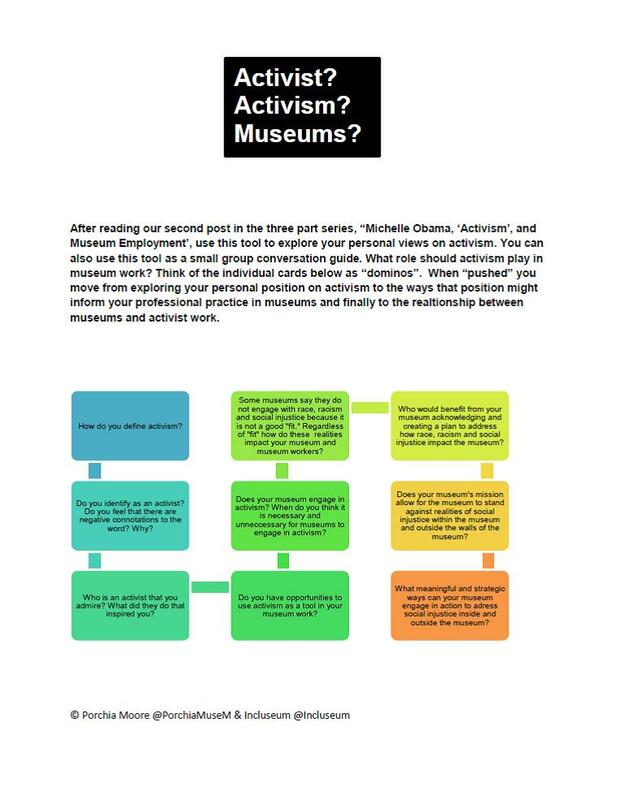 While we wrote our post, Michelle Obama, Activism and Museum Employment Part II, we were also developing a tool we imagined could facilitate self-reflection and group conversations on the topic of activism. The direction that the post went in its discussion of activism, as well as the follow up exchange on twitter around diverging perspectives on the term “activism,” directly informed the creation of this tool. The tool can be used in tandem to the blog post itself. Our hope is that the tool and the blog post will incite personal and practice-based reflection on activism but even more so engagement with the idea that we advanced in our post; that, no matter the “fit” with the museum mission, there are ways/imperatives to stand against racism and injustice. “Activist” is a label that museum workers, and museums, may or may not identify with. Discussing the concept of activism and our understanding of it can give us an opportunity to evaluate why it may or may not resonate with us. In so doing we can be more conscientious of its use, understand in what situations it might not be applicable and/or embrace its use as necessary. However, whether we consider ourselves “activists” or not, there is no avoiding the everyday realities of injustice and oppression that operate within and outside of our museums. It’s all about how we respond to it or ignore it. That’s why we developed the tool below. The pdf version is here and the preview image is below. If you use it tool, please let us know how you used it and what the outcome was! A very short post, but with a good invitation to think about the mission, purpose and tasks of a museum and our practice.